JUST LISTED! 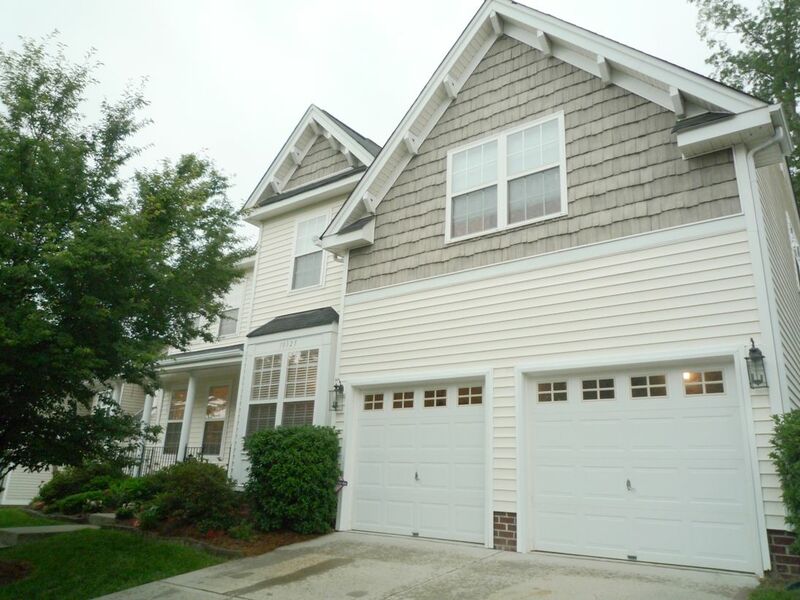 Craftsman Style 4 Beds, 2.5 Baths Beauty With Must-see Floor Plan In Riverbend in Charlotte, NC! JUST LISTED! 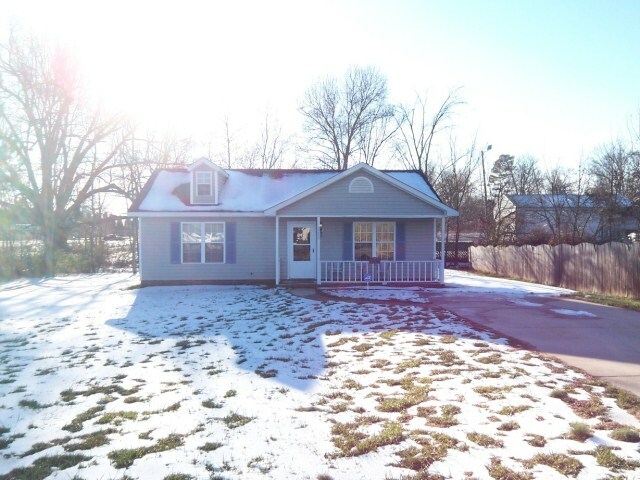 Charming 3 Beds, 2 Baths Home On Quiet Corner Lot And Great Location in Olde Whitehall in Charlotte, NC! 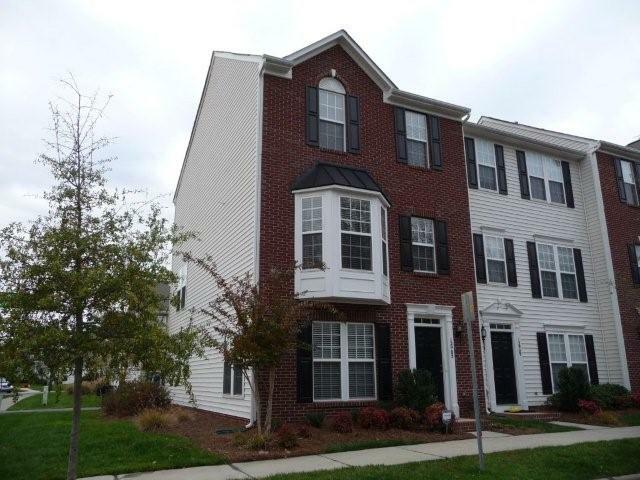 New Don Anthony Realty home for sale in Olde Whitehall in Charlotte, NC! 3 beds, 2 baths for $118,000! Take Time To Enjoy The Outdoor On The Front Porch Or Back Patio! Big Corner Lot With Level Backyard. NEW Roof, Furnace, And Laminate Floor. Wood Burning Fireplace And Plant Shelf In Vaulted Living Room. Addition Enclosed By French Doors Has Multi-Uses. Outdoor Storage Shed With Work Benches And Electricity For Convenience. Refrigerator, Washer/Dryer Stay. Great Location-Close To Shops And Major Highways. SOLD‼! 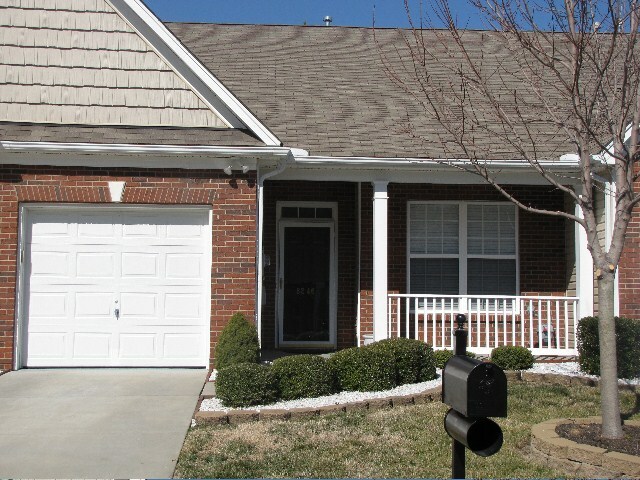 Home in Arvin Village in Charlotte, NC! Our Clients Saved $1,001 when Don Anthony Realty sold their home! Congratulations! SOLD‼! Home in Blakeney Greens in Charlotte, NC! Our Clients Saved $3,551 when Don Anthony Realty sold their home! Congratulations! 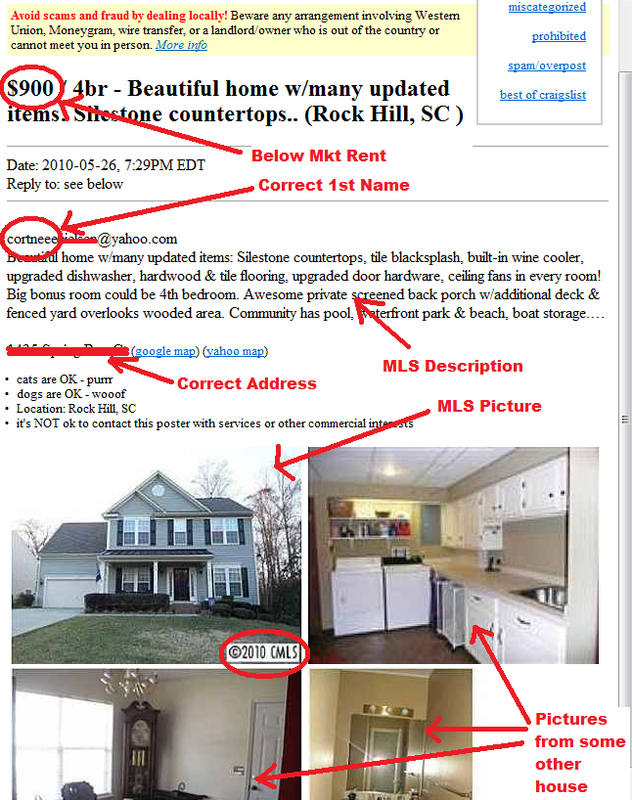 Many people who want to sell a home for sale by owner use Craigslist.com to advertise their home for sale. This site has even begun to become popular with Realtors® looking to provide additional advertisements for their clients. Unfortunately, there are some bad people out there who also use this website to try to steal money from people who view this site looking for a home to rent. One of the scams I’ve seen before has come up again for one of my clients. Today I was contacted by a person looking to rent a home. They saw an ad on Craigslist for one of the homes I have listed for sale on the MLS covering Rock Hill, SC and also on the Charlotte Region MLS. They liked what they saw on Craigslist so they decided to drive by the home to check out the home and the neighborhood. When they saw my sign in the yard, they were a little confused, so they called me. The home rental price that was being advertised was very attractive for the value of the home. That is one of the first signs that something may not be right and it’s a potential scam. The scary thing about these scams is that the scammer goes through the effort of making many of the things with the house look correct…. They have a correct front picture, they have the correct address, and even the correct name of the owner in the fake email address that they have created. All this is in an effort to get the potential tenant to believe they are dealing with the owner. What I understand happens when the potential tenant contacts the scammer is that the scammer comes up with some reason why the potential can’t see the inside of the home right away. They somehow try to con the tenant into giving them a deposit, in some cases, it’s a “key deposit” that will allow the tenant to get a key to see the inside of the house. Meanwhile, the scammer gets the money and is never to be heard from again. The main lesson of this is to be careful when you have your home on the market. If you are selling your house for sale by owner, consider hiring a Realtor to advertise your home and help be a guard against potential issues. Even if you have hired a real estate agent, it doesn’t mean you can completely relax, as you should still be on the lookout for potential scammers and other criminals who are looking to take advantage of the situation. JUST LISTED! 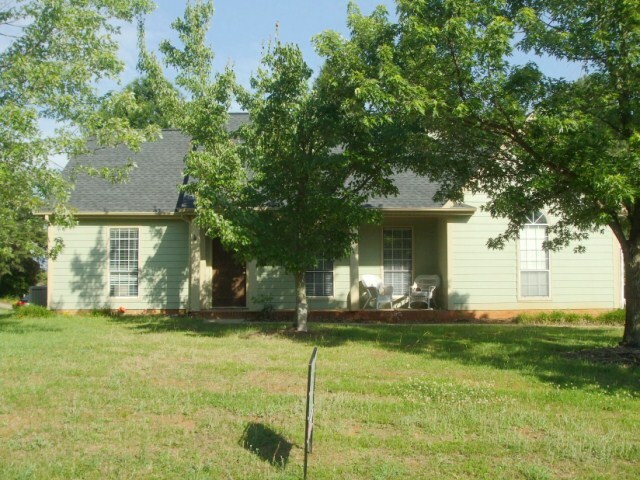 Open, Immaculate And Well-maintained 2 Beds, 2 Baths Home In Rocky River Crossing in Harrisburg, NC! New Don Anthony Realty home for sale in Rocky River Crossing in Harrisburg, NC! 2 beds, 2 baths for $168,000! Immaculate Open Floor Plan! Beautiful Rich Laminate Flooring. Granite Countertops. Big Island With Sink And Breakfast Area. Office Niche Has Custom Built Cabinets. Gorgeous Wood Bead-boards Surround The New Addition With French Doors. Vaulted Master Bedroom Has Custom Shelves And Niches On Wall. New 14 Seer HVAC Unit For Energy Efficient. Finished Garage Is As Clean As The Inside. House Has Been Lovely Maintained!